My loves, in the left corner you’ll find Balmain’s brilliant Oversized Cotton Military Shirt; in the right corner we have J. Crew’s Surplus Shirt-Jacket. While the jazzy J. Crew piece lacks the epaulets and more militant-style buttons of the Balmain; at just $78.00, as opposed to the $1,345.00 asking price of the Balmain beauty, it is just as effective at providing the wearer with the “warrior woman” aesthetic you may be searching for, at a price that is far friendlier to one’s wallet. Which role are you playing today, darlings…the frugal femme fatale or the sassy spendthrift? I like the J. Crew one better actually. Buttons can be changed. I would just change the J. Crew buttons to better military ones because that Balmain's jacket is wayyy too expensive. I would change the buttons with a sassy smile!! I prefer the JCrew one actually, but I'm sure you could find an even cheaper one at a thrift store! I actually love the J Crew jacket way more. It looks a little more distressed and textured. Love it! Got to love the military look! I agree Im loving the JCrew one better, has that "lived in" look! Nice alternative to Balmain, darling! You really do your research! I like the JCrew one best, I think, but this was a hard choice! Seriously loving both! I am def in need of one, too, so I appreciate the find! While the Balmain one is more military crisp, I would have to go for the J. Crew one (& prolly will when I go on my shopping spree next weekend!). Even if I had the spare change for the Balmain, I could never spend that much on a shirt. Thanks for entering my giveaway, and for your advice! I def need all the help I can get... I'm completely incapable of making decisions on my own, LOL. Today I'll go with the Balmain. It has a sleeker, more streamlined look for the $$. It's a nice, wearable trend. I'm all about the Crew number! Like the JCrew one. I'm always happy about the quality of anything JCrew that I buy, it seems. I like the J.Crew one better because it has a feminine fit that doesn't make the jacket overpowering. I like the steal one better! Hi Erikaaaaa, amazing post, like usual ^^. Anyway I wanted to let you know that you won an award on our blog :) xoxo laura. I dunno..that's a lot of dinero for either. I'd go for the real thing down at Salvation Army..it might be the fatigued look..and real patches too. I think of my brother's dungry jacket that he got from Dad. He looks so cool in it..and well, it has a history to it, as well. I have to admit..nothing more comfortable than the old green fatigued pants. Of course, they might be too high waist for some. I actually quite prefer the J.Crew pick -- adorable! I definitely prefer the J. Crew one. It looks so much more casual and wearable. NICE find. I would definitely go for the J Crew one, agree with Sherin. Looks so much more wearable. I am absolutely slack-jawed at the $1345 price tag. SERIOUSLY?!?!? I mean, neither of these shirts are my style, but even if I loved it with all my heart I simply cannot FATHOM spending the same amount of money that could buy me a round trip plane ticket across the world . . . omg! I need one of these military shirts in my life! I can imagine pairing one with so many things in my wardrobe... and I'd definitely go for the J. Crew version! Thrifty and pretty! What a cute shirt! But oh my, $1,345.00 is a lot of money! I think the J Crew version is every bit as lovely as the Balmain! What a great find! I like the J. Crew one. They've really dove into this type of style now, muted colors and all. I must say I do miss some of the brighter colors! balmain is amazing but i definitely can't buy anything from them..until maybe i'm an actual lawyer :P .. love the jcrew version! that's absolutely a fasbulous bargain! I really like the military look! And the J.Crew jacket is definitely the way to go here, both in terms of price and style. I'm a little addicted to J Crew, so that would be the item of choice for me. Is your Balmin outfit pic on the left for a guy or a gal? Hello dear, I feel I haven't stopped by lately so wanted to say hi and yes to the J. Crew shirt! I actually really like the JCrew one because of it's detailed pockets! Hmmm..I don't think I'd need one that expensive. Ooooo I like it I like it! Thanks for the tip, ive been looking for a nice army shirt! I love the military look but I never actually like it on me, you know? But I appreciate that you featured it because Balmain is, well, Balmain and fabulous. A gal can dream. I like the j. crew on e best! Saw so many at Barneys yesterday and this J. Crew one is by far THE best! While I love them both, I am definitely the frugal femme fatale yet again. The J.Crew version is just as fab!! 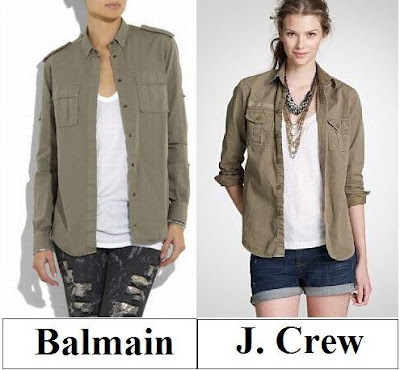 I love anything Balmain BUT I also love J.Crew (as does my wallet!) so this one's a no brainer! i love anything by jcrew ! I'm definitely hearting the J. Crew pick. I actaully like the J.Crew one a lot better! Gasp! I am going with the J. Crew shirt! I love that J Crew one. Cute! Sorry the link is so long! Love the millitary look!!!! I am designing a line to focus on this look! and check out my blog about the millitary look! It's always a happy surprise when my favorite piece is the cheaper one!